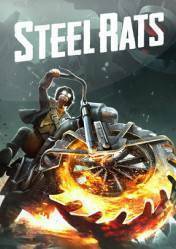 In Steel Rats we will become an authentic Steel Rat, a street motorist and gangster whose mission is to face an army of invading alien robots. The first thing you have to do is select one of the four Steel Rat available, each with its own motorcycle and its virtues. Then we must walk the streets of our city in search of enemies. Terrible and murderous alien robots who are willing to annihilate everything we love. Drive in style through the futuristic retro world of Steel Rats. Set in an alternative version of the 1940s in the United States, prepare and ride your chrome stallion and save Coastal City from the invading horde of Junkbots. Your motorcycle is your weapon designed to crush your enemies in amazing, stylish ways. There are no comments yet about Steel Rats. You can be the first one! Steel Rats Gameplay - Smash Look!